Opening Weekend Football on TV! It’s finally time, kids! We’ll cover all the games this wonderful Labor Day weekend. 8:00: LSU @ Mississippi State (ESPN): Marginally better than the first game as Miss State goes to the slaughter for the football desperate masses. 10:00: Utah @ Oregon State (FSN NW, Utah, and Pacific): This may actually be competitive. My money’s on OSU, though. Washington @ Syracuse (ESPN): Two terrible teams face off on a Friday night in a dome in rural New York! I really don’t have much else to say about this. East Carolina @ Virginia Tech (ESPN): Take a drink every time the word “tragedy” is mentioned! VPI rolls. Alabama-Birmingham @ Michigan State (ESPN2): I’m sad because I no longer have John L. Smith to make fun of. Colorado State @ Colorado (FSN): Lost in the fact that CU is terrible is that there’s an honest-to-god rivalry game in the opening weekend! This should be pretty fun. 12:30: Western Kentucky @ UF (Gameplan/LF): I just laid down the cash for Gameplan, and I’ll be dammed if I’m not going to use it. For 5 minutes. Georgia Tech @ Notre Dame (NBC): (Breathe in) (breathe out) Oh man. This is it. Everything before this is filler. One of like 3 worthwhile games of the day. An entire non-ND nation wants us to win here. I want us to win here. However, I hate predicting GT games. Both teams have new quarterbacks, but ND has a lot more questions have skill positions and is switching to the 3-4 defense. GT returns the ACC’s leading rusher and has hired an offensive coordinator who (presumably) knows what the hell he’s doing. At any rate, GO JACKETS! Nevada @ Nebraska (Gameplan/ABC): Uh, woo? Wake Forest @ Boston College (ESPN/ABC): Early ACC action! I like BC and their QB here, though. Washington St. @ Wisconsin (ABC/ESPN): Not terribly excited about this one. Wisconsin should roll. Missouri vs. Illinois (ESPN2): This is a toss-up. A toss-up of crap. UCLA @ Stanford (FSN): UCLA rolls. 6:45: Oklahoma State @ Georgia (ESPN2): To hell, to hell, to hell with Georgia… at least, I hope so. Go Sooners! 7:00: North Texas @ Oklahoma (FSN): OU rolls. 7:45: Kansas State @ Auburn (ESPN): AU rolls. 8:00: Tennessee @ California (ABC): And we round out the day with the probably best overall game. I love these sorts of intersectional matchups. If I have some time, I’ll figure out the last time an SEC team traveled to California for something other than a bowl game. 10:00: New Mexico @ UTEP (CSTV): Miners? I guess? Gah. 10:15: Idaho @ Southern Cal (FSN): 7:15 pacific, so I’ll probably watch it. 4:00: Texas Tech @ Southern Methodist (ESPN): I’ll be at work. 8:00: Florida State @ Clemson (ESPN): Bowden Bowl! Clemson, with a stable of running backs should be able to take out Papa Bowden. Well, that was mediocre. Trust me when I say I’m pretty excited about the interesting games (especially ours) but outside of that it’s a bleak slate. Alas! What is important is that the college football season is finally here! This entry was posted in NCAA Football, On TV This Weekend on August 29, 2007 by ASimPerson. I almost broke down in tears today when I realized that USA Today’s sports section made no mention of college football. It has been way too long since Division I-A was in session. Thank the Lord that we are only a week away from the fourteen best weeks of the year. Not that the first weekend of the season is going to be anything spectacular. Thanks to the added twelfth game, most of the major powers scheduled automatic wins. So did the lesser powers. Out of sixty-eight games, twenty-three (one-third) of them involve AA opponents. The entire season is irrelevant, though. 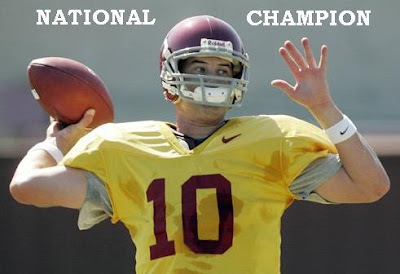 The established sports media already declared USC to be the undisputed national champion of 2007, and their word cannot be challenged. “If USC is as good as most believe, chasing down the Trojans could be too much to ask.” – The Associated Press ( http://sports.espn.go.com/ncf/news/story?id=2980349 ). Nevermind that the Pac-10 is a joke conference (as Tennessee will hopefully prove next Saturday) with only one contender. Nevermind that preseason rankings are no guarantee of success. If you don’t know this guy’s name, you must have never been to ESPN.com. Well, I guess I have a few months to elaborate on my bitterness against Pete Carroll’s crew. I’ll be back next Thursday with my predictions through Sunday. Don’t lose heart; just one week left! This entry was posted in Uncategorized on August 23, 2007 by Kenneth. Before we start proper back into the swing of things here on asimsports, I’d like to take you on a review of Georgia Tech’s 2006 football season. Because hindsight is 20/20, not only will I recap the games, I will also highlight some of my colleagues and I’s statements, and point out the predictions that were folly. 2006, like most of GT’s seasons, saw the highest high (beating Virginia Tech in Blacksburg) and the lowest of lows (losing to Georgia again, then blowing the games after that). Anyway, let us begin. In Tech circles, a lot was made a helmet-to-helmet call against us on Brady Quin. It was definitely a bad call, however, listening to some folks you’d think the refs walked over to Charlie Weis after the play to recieve their payoffs. The fact of the matter is that there was around 7 minutes left in the 3rd quarter, and I have a hard time believing any call made with that much time left can seriously impact a game. Tashard Choice was outrushed by Reggie Ball. Tashard, as you should know by now, led the ACC in rushing last year. This game did not help him all that much. He had 14 carries for 54 yards. Reggie had 11 for 55. Tech was terrible on 3rd down, going 2 for 10. Tech had only 259 yards of total offense and held the ball for 24 minutes. Reggie was servicable, going 12-24. More importantly, he didn’t throw any interceptions. Essentially, Tech had yet to find itself on offense and couldn’t stay on the field, which led to the critical lack of additional offense to back up the defense. I’ll probably say something similar near the end of this article. Lots of guys got to play. Taylor Bennett went 7-13 in mop-up duty. Tashard got himself 78 yards rushing here, gradually working his way up to those nice games he had in the 2nd half. Anyway, one of the questions Tre’ [Battle] answered in the [halftime video board] interview was what three things he would bring with him if he were trapped on an island. Tre”s [sic] response was, “A helicopter, some fuel…and a trillion dollars.” Initially, I wondered, “What are you going to do with a trillion dollars on a deserted island?” Then, I realized the genius of it. You could fly the helicopter to land and spend the money on things! What kind of question is that, anyhow? If you were going to a deserted island with the knowledge that you would be stranded, of course you would bring things that would help you escape. Poor Virginia, though. I don’t think they’re the best oppenent we’ve beaten this year – I think Troy could probably take them by a touchdown or two. Did you see their “passing offense”? That guy made Reggie look positively awesome (Reggie’s never been as bad as that guy was). I think my brother summed it up best: “These guys couldn’t score against air.” The UVA QB threw everywhere but at his receivers, and in the off chance he actually got it to them, I think they were so surprised they just dropped it. Our receivers are okay this year – we’re lining up playmaker Rashaun Grant in the slot and have shown depth behind Calvin. Our running game could use some work, though – I like that we’re trying to use the option, but Reggie pitches too soon and Choice seems to have trouble turning the corner and running upfield. That last statement was prophetic, because once we did get that running game working, well, yeah. Tashard had 83 yards on 19 carries. Reggie had a pretty good game going 10-19 with 2 TDs and caught a pass from fullback Mike Cox. All-in-all, GT did everything they were supposed to do in this. And looking sharp doing it, as they wore their retro gold jerseys with white helmets. Other highlights from the recaps that week include the premiere of the On Notice! feature and Tito wore an authentic sombrero to protest the scheduling of Buffalo. The only prophetic things we had to say was that the upcoming game at Virginia Tech probably wasn’t going to be 51-7 again. Well, we were definitely correct. This was the most important victory Georgia Tech had all season. “Beamerball” – If I told you that there was a blocked punt and a defensive TD in the VT-GT game, you’d assume that VT was the team to have done both. And you’d be wrong. Basically, everything went right for GT in this game. I don’t think we played nearly as complete a game the entire rest of the season. One of these days, I’m going to post my frame-by-frame analysis of why Micheal Johnson is awesome. This was a game that usually during the past few years GT would have easily lost. They were down 20-14 going into the half, and then 23-14 at the end of the 3rd quarter. It did not look good. Then the defense stepped up. After scoring at the beginning of the 4th, on the first play Maryland ran resulted in a fumble that GT recovered at the Maryland 17. The downside was this was probably the last good game Reggie played. He got his legs hurt and we got away from the options and draws we ran early in the year. This was a crucial dimension for the offense – without his legs, Reggie went from a somewhat serviceable dual-threat QB to a very bad pocket passer. He wouldn’t complete more than half the rest of the season (except against Duke). Indeed. Tech had a mere 205 yards of offense. Clemson had 321 yards of rushing offense (and 426 overall). Clemson scored so quickly on most of their drives that Tech actaully had a nearly 5 minute advantage in time of possession. Because Tech got down quickly, Tashard had 15 carries and only netted 48 yards rushing (the last time he’d be held under the century mark for the remainder of the season). This game provides a blueprint for how to beat Jon Tenuta’s defense. Tech’s defense is fast, but is not very big or deep (though it’s better this year, at least on the line). Our secondary is also shaky. We make up for this by throwing weird zone blitz packages at the QB, hopefully pressuing them into making bad decisions. Problem is, when you have 2 really good running backs (both of Clemson’s backs rushed for over 100 yards – Davis got 216, Spiller got 116) you can just pound away at the defense it and it will eventually break. Since the safeties or linebackers are usually blitzing instead of staying back, one you get past the line of scrimmage you are home free. West Virginia would also exploit this. But as I said, you need good backs and some mountains on the offensive line or else the d-line will stop you, and those linebackers start tackling you in the backfield. This, of course, made Clemson look like world beaters at the time, but then they got shellacked themsleves up in Blacksburg the next Thursday. Whoops. Anyway, let’s move on. I am pretty sure this is the only game ever to inspire someone to upload a bunch of punts to YouTube, but hey, when you kick out of your own end zone and keep their return guy behind his own 40, well, that’s highlight worthy punt. Also, Miami helped with 2 turnovers off punts. Tech came from behind again, though in decidedly less dramatic fashion. They got it tied at the beginning of the 4th at 16, then scored 2 touchdowns to put it away. This pretty much sealed the division for Tech. But still, it seemed as though the offense was slowing down. GT led at the half but allowed NCSU to climb back in the 3rd, but Travis Bell made a FG and put us ahead for good with 9:09 left in the 4th. Career days here for Tashard and Calvin, but Reggie was 13-35. I wasn’t able to watch this game, so I don’t have anything terribly insightful to say about it. GT pretty much took care of business. I did, however, watch this game. And needless to say, this is when some eyebrows started to be raised about the offense – eyebrows that would eventually not miss the departure of Patrick Nix. This game officially clinched Tech’s division title. I don’t remember much of it. It quite lackluster and with Duke ahead, all eyes were turning towards Game #12. Not much to say here, either. Calvin did his thing, Reggie threw 3 touchdowns and Taylor tacked on 2 more. The second teamers came in in the second half, with Taylor, Jamaal Evens, and Greg Smith putting on a show. Reading back over the lead-up to the Georgia game is intensely depressing. We all felt we had an exceedingly good chance to win last year. Orson summed it up pretty well over at EDSBS, and well, hell, at least I can derive some humor now of the comparison of Reggie Ball to a minor bit character from The Hitchhiker’s Guide to the Galaxy. Once again, Reggie Ball and the Tech offense he “leads” looked awful. The quarterback hit the Johnsons a few times, but most of his passes were not on target. I still can’t figure out why the Yellow Jackets continually called deep shots downfield when Ball kept missing his receivers. Ball’s scrambles seemed impulsive and didn’t produce many yards. I was right about the close defensive struggle, but I should have said the two teams would score less than thirty points combined. This was probably the worst game of the day for those watching TV. Due to the drizzly weather, the fans in the stands probably didn’t have much fun either. Reggie even threw in 46 yards rushing, his most on a couple of months, but he was 9-29 on the day and didn’t complete a pass to anyone not named “Johnson”. Tashard put in his 100 but it wasn’t enough. Also, Patrick Nix called a reverse on 3rd and 1. Did I mention no one misses him? We got an invite to the Gator Bowl after that, and Reggie was declared academically ineligible. Unfortunately, so was our only good cornerback, Kenny Scott. This was a defense optional game. As discussed above in the Clemson game, WVU had the tools to exploit our defense. However, we were also able to exploit their terrible secondary to the tune of Taylor’s 19-29, 326 yard, 3 TD performance. Calvin got 9 of those receptions and 2 of those touchdowns, and Tashard had 27 carries for 169 yards. Tech was ahead 35-17 3 minutes into the 3rd quarter when the wheels started to come off to the tune of 21 unanswered WVU points. After the second of those touchdowns, a line drive kick off bounced off Tony Clark and was recovered by WVU, setting up Pat White’s go-ahead touchdown. Tech would have opportunities in the 4th. One drive got to the WVU 17 before ending in an interception. Holding WVU, Tech regained good field position but was unable to get a first down and settled for a 54-yard field goal, which Travis Bell missed. Tech never got the ball back. And that’s it folks. I’d post some other stats from the year (such as the number of times we predictions OSU or Michigan would shred whoever they faced in the title game – whoops! ), but it’s late and I’m tired. Coming soon: a look at the future! Remember, it’s less than two weeks away. This entry was posted in college football, georgia tech on August 19, 2007 by ASimPerson.